We’ve reported in many one-wheeled vehicles before, such has the supercharged UnoCycle and the probably never to be developed Audi Snook. This would be the Hornet, a superbike developed by Liam Ferguson. I realize that it looks very unsteady, and I would have to agree. 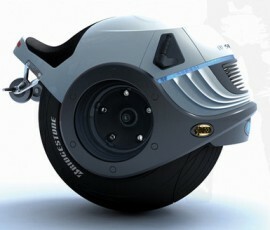 But it actually has two wheels, placed side by side, to keep it “balanced gyroscopically whenever it is parked”. Whenever the rider accelerates the motorbike, it can tilt forward to lift its rear stabilizer wheels off the ground to put all weight on the central wheel. It has a dual 74 horsepower (55 kW) in-wheel hydrogen fuel-cell six-pahse Neodymium-Iron (Nd-Fe) electric engines, good for keeping a top speed of 235 kilometers per hour. I’m guessing that the driver straddles the seat here, and grabs what looks like handlebars. That certainly looks like that could take you were you want to go, fast. It certainly looks like it won’t take you there safely, but maybe this is the point. It sort of reminds me of a vehicle from Mega Race in the movie Spy Kids 3: Game Over. I remember thinking that those vehicles were extremely odd and could never actually run, and I am wondering, after viewing this Hornet, if I am right. I think I saw this on “Dragon’s Den”, Brett Wilson invested in this thing. I’m not sure what to think about it- I’ve heard there’s a fine line between genius and madness, and I tend to believe this has both.